The following paper comes from a presentation given at ECREA in 2010 and at NCA in 2011 (the version of which can be found here on the blog). I submitted this paper to a journal, but never did anything with it after it was rejected. I still think there are interesting ideas in the paper, so I wanted to share it here. How do we make sense of the world around us? When faced with a situation that is new to us, what do we do to understand what is happening and what is required of us? Such questions have been with us for thousands of years, whether faced by individuals within such situations, or addressed by organized scientific, philosophic, cultural or other fields of thought. Coming from a trajectory of reception studies and audience studies, these situations can be any time a person chooses a new book to read, watches a new motion picture, starts a new video game, or enters a virtual world for the first time. In engaging in these activities, people bring into the situation any number or type of cognitive and emotive behaviours to help them through it. From expectations based on knowledge of the media product’s genre to information gleaned from word-of-mouth critiques, our experiences can help us make sense of the content and the technology with which we engage. This article considers how people utilized their personal experiences to make sense of the first time they stepped into two specific virtual worlds. In an experiment for the Danish Virtual Worlds Research Project, relative novices engaged with four types of media products, including a game world, City of Heroes, and a social world, Second Life (Reinhard, 2010). The participants were interviewed about their experiences by utilizing Dervin’s Sense-Making Methodology (SMM) to inform the data collection and analysis. What emerged during the study were participants making comparisons between what they were doing and either what they had done or knew of to make sense of these new experiences. In other words, they were describing their experiences metaphorically: they were making comparative statements linking two entities based on some perceived similarity or dissimilarity. They were looking for overlaps between experiences in order to transfer knowledge and/or skills from the familiar to the unfamiliar. This article begins with defining the nature of the virtual worlds and the conceptualization of sense-making. After an introduction of the methodology and method of data collection and analysis, the metaphors are presented for how they relate to specific sense-making instances: the questions people voiced, and how they felt helped or hindered in the media engaging experience. The analysis is then used to discuss the utility of metaphors as part of the sense-making process, and how the study of people’s metaphors could assist designers to create technology and content to better facilitate people’s experiences with virtual worlds. Of the range of media products people encounter in their daily worlds, virtual worlds are a growing segment. By some estimates, approximately 800 active online spaces could be considered virtual worlds, with over 2 billion men, women, and children registered with one or more of them. From a common definition, virtual worlds are the reproduction of the appearance of the physical world in a digital environment into which people, via digital representations or avatars, can gather and engage in a variety of social and personal activities (Bell, 2008; Schroeder, 2008). Virtual worlds can be defined as media products that attempt to replicate aspects of the physical world through digital (re)construction. These aspects may be reconstructions of real times or places as they do or have existed in our physical world, such as the reconstruction of the Berlin Wall in the virtual world Twinity. Or these aspects may be constructions of times and places that have not or could not exist in our physical world, such as the construction of fantasy lands in Age of Conan or galactic empires in Star Wars Galaxies. Virtual worlds, as digital artefacts and constructions, do not (re)present any aspect of the physical world unless through conscious design, either by a production company or the combined efforts its users. Their formation, population, promulgation, and presentation are wholly dependent upon the actions of people, producers and users, working in concert. The more common versions of virtual worlds are structured for gaming, such as World of Warcraft or EverQuest. Such worlds are designed by a production team, such as the gaming company Blizzard, and are offered to users to play, usually for a subscription or pay-as-you-go fee. Others may involve some aspect of gaming, but their primary design is to facilitate social interaction amongst people, such as Blue Mars or Habbo Hotel. To reflect this perceived dichotomy in types of virtual worlds, the study involved a representative world for each category to ascertain if there would be differences in how people make sense of the one versus the other. City of Heroes was chosen to represent the game worlds, and Second Life was chosen to represent the social worlds. 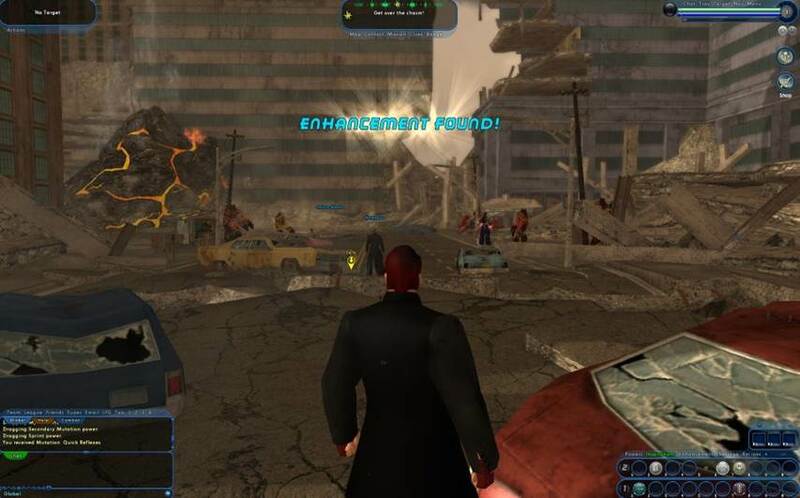 Created by Cryptic Studios in 2004, the game City of Heroes was designed to be a standard massive multiplayer online role-playing game (MMORPG). After subscribing and creating an account, the user creates an avatar; in the version used in the experiment, the user had the choice to create either a superhero or a supervillian avatar, and to play the game from either perspective. The user is given the work of first customizing the avatar by selecting its appearance and its abilities. After this task is completed, the user can complete a tutorial to be taught how to engage with the world, or the user could simply enter the world. Once in the world, the user is given a series of tasks to complete; completing the tasks advances the avatar’s abilities through the acquisition of experience. Some tasks can be completed individually, while others require finding other users for collective actions. The virtual world is constructed to present a space that resembles common tropes in the superhero genre: a metropolis that is fantastical or enhanced via magic and/or science fiction. Along with being populated by the users’ avatars, there are non-player characters to assist in the completion of the tasks by being advisors or victims. Thus, engaging with the game is akin to stepping into a superhero story, through the actions and construction of the world. Created by Linden Labs in 2003, Second Life is perhaps the best known social. In the first decade of the 21st century, it received media attention for being a new marketplace for real world institutions and corporations to invest in to reach the “inhabitants,” or those users who were “inworld” or in the world. While Linden Lab provides the server space and the basic rules for engagement with the world, they are not responsible for the content of the world. Linden Lab created a world of islands amidst a never-ending ocean, thereby trying to recreate the basic geologic profile of the planet. In order to create content within the world, people had to buy islands from Linden Lab on a subscription basis. However, once the user owns the island, the user has largely free reign to build on it as desired. Islands have been built to contain a variety of human activities, places, and times; from recreations of historical citadels to fictional cities, from television studios to shopping malls, and from universities to cabarets, the entire range of human activity, history and desires can be found somewhere represented in the world. Unlike City of Heroes, none of it would exist if people were not learning and utilizing the rules and building tools created by Linden Labs. The user-generated nature of Second Life has served as a model for other social worlds, such as SpotOn3D and Blue Mars. The current view from reception and audience studies about a situation involving engaging with a media product is that the situation involves at least some activity on the part of the person. This activity could be the physical interactivity required by newer digital media, whereby the person must perform some physical activity upon, with or against the technology to access or progress the content contained within the media product. However, interpretive interactivity can be thought of as the cognitive and emotive activities upon, with or against the content or even the technology (Reinhard, 2011). It could be argued that any situation of engaging with any media product, digital or analog, requires at least some amount of both interpretive and physical interactivities. It is the interpretive interactivity addressed in this analysis. How a person cognitively and emotively acts within a situation of media engaging is involved in how the person makes sense of the media product. Such interpretive acts could occur before, during and after the situation, in the form of expectations, actions, and reactions. A person’s sense-making process in a media engaging may be informed by that person’s everyday life, the pressures from sociocultural factors, the influence of psychographic traits, and the nature of the media product being engaged, such as the structure of a game world versus a social world (Reinhard & Dervin, 2012b). However, it is the process that is the focus of study: the agency of the person within the situation. This view on the sense-making process is informed by Dervin’s Sense-Making Methodology (SMM) (Dervin & Foreman-Wernet, 2003). SMM discusses the need to understand this process within situations so as to highlight the person’s agency through studying specific sense-making instances. As an approach, SMM understands these instances as the full range of internal and external communicative behaviours people perform daily. This study focuses on those internal behaviours that align with cognitive and emotive acts. By conducting in-depth investigations into how the situation was experienced by the person, these instances can be highlighted and compared to understand how the person made sense of the situation, and why the person made sense of it that way. By highlighting specific instances, we can understand what specific aspects of the situation the person was (re)acting upon, with or against. SMM itself is informed by a fundamental metaphor: a situation encompasses the human mandate to move through time-space and to habitually or otherwise navigate that movement Dervin, 2008). Within this overarching metaphor are metaphorical understandings of situation as a “journey” involving “gaps,” and “step-takings” (Dervin & Foreman-Wernet, 2003). SMM uses the idea of discontinuity or gap as a central metaphor in its methodological foundation (Dervin & Foreman-Wernet, 2003). Methodologically, the discontinuity assumption allows us to attend to how people make sense as they move through the before, during, and after of situations, such as media engagings. In some of these movements, the person may face struggles or confusions within the situation that leads to questions; the person feels stopped in movement through the situation, when facing a discontinuity or gap. In some of these movements, there will be no questions asked, only repetitions of thoughts, answers and practices from the past; such repetitions are metaphorically seen as bridges over the gap. In some attempts to bridge, there will be abrupt stops and many accompanying behaviours to restart the movement: behaviours like getting ideas, searching for answers, having an emotional response, or even asking more questions. All of these behaviours could arise new within the situation and help to construct this bridge. The building of the bridge can be seen by the person for what helped or hindered the movement. SMM has developed around this central metaphor interviewing protocols (Dervin, 2008) to address how the person interprets the material and phenomenological stuff of their movements. The gaps are questions addressed. Emotions, ideas, thoughts can become the “material” of the bridge. The utility of such material are seen as what helped and what hindered. The SMM interview protocols are structured with queries to elicit all of these instances wherein sense-making occurs. For this article, the specific sense-making instances analyzed were the participants’ descriptions of the situations and discussions of their questions, helps and hindrances when engaging with the virtual worlds. The study’s sample consisted of 14 people in Denmark. Three main demographic features were used to gather this sample: gender, age, and experience with the media product. For gender, there were seven men and seven women; for age, they ranged from 15 to 58 years old; and for experience, they had differing degrees of experience with different types of videogames and virtual worlds. They were asked to engage with four specific media products they had relatively little to no experience with, although containing content with which most were familiar from the superhero genre. In the study, participants engaged with specific titles from four types of media products: film, console videogame, game virtual world (City of Heroes), and social virtual world (Second Life). The media products were chosen to reflect a consistent content, that of the superhero genre (Reinhard, 2010). City of Heroes was chosen because at the time of the study it was the only available gaming world featuring superheroes. 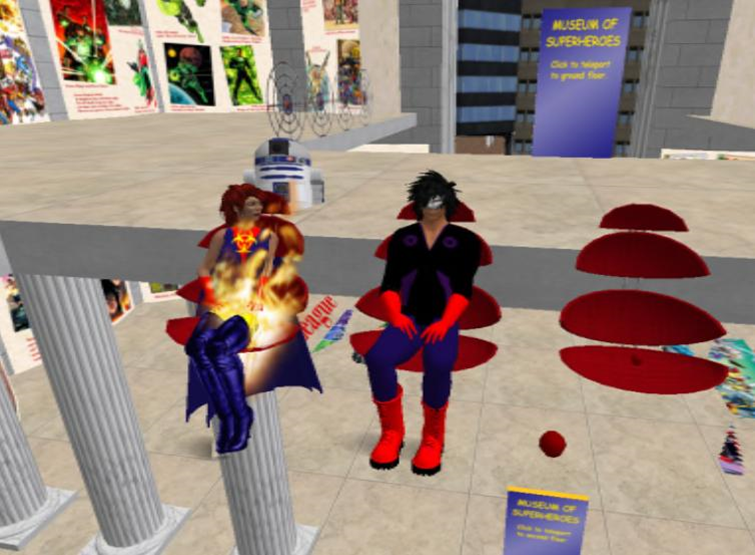 Because Second Life was not originally designed to be a superhero world, a section of the world, or an island, called Metrotopia was designed to meet the study’s needs by reflecting superhero genre tropes. For these sessions, participants were brought into a laboratory setting. While they were engaging with either virtual space/place, they were encouraged to vocalize their reactions to the media product. Participants were required to engage with the worlds for 30 minutes each; at the end of that time, they answered SMM-inspired questions and could decide if they wished to continue with the engaging or to end the session. After completing the experiment, the participants were interviewed using an SMM-inspired protocol to recall the experiences in-depth (Reinhard & Dervin, 2012a). While there were four sessions that constitute this study, only two involved virtual space/places; thus, a total of 28 situations were available to analyze. The analysis focused on the transcribed SMM interviews as these interviews provided the systematic collection of sense-making instances for analysis. Comparisons were identified with the structure: “This virtual space/place or aspect of it is/is like/is similar/is dissimilar to this other thing.” That is, participants would discuss how they could “see this as that” or “see that in this”. Not included in the analysis were discussions comparing any aspect of the experience as similar to the other experimental sessions. What were identified were comparisons to people, places, situations they had personally experienced, or the usage of descriptive words that did not match what happened in the experience. These comparisons were identified for times when they were mentioned in relation to specific SMM sense-making instances: discussions of questions or how helped or hindered they felt in the experience. As a thematic analysis, the comparisons and sense-making instances are represented with minimal alteration of the participants’ original phrasing, which were only undertaken to provide clarity to a statement. Participants quite frequently utilized comparisons when recalling their experiences with the two worlds; every participant, at least once, made a comparison in their recollections. The comparisons would occur as part of the participant’s attempt to describe an aspect of the situation. Whether this description was to oneself or to me as the interviewer was not clear, as indeed the one may be concurrent with the other. At times, the comparison was related to the participant having questions, struggles or confusion with the particular aspect being described. Sometimes these comparisons would then relate to the participant feeling facilitated or hindered by that particular aspect of the situation. What follows are the analyses of these four different types of comparisons. At a basic level, a comparison involves the participant interpreting some aspect of the experience with the virtual space/place as similar to something else; specifically, something from a previous experience with which the participant dealt. These comparisons could be based on an action the participant did, or on the nature of some entity the participant dealt with in the experience. In the comparisons the participants made, actions were linked to actions, entities were linked to entities, and both types can be seen when they were describing the experience of engaging with the virtual space/places. For City of Heroes, a number of people discussed the actions the game required of them as being similar to other actions they had performed in the past. Jakob (man, 24) discussed the avatar creation process as being similar to the process in war games, which he said were also similar to another hobby. In this comparison, he links together three games that share a similar feature and requirement for engagement; such a comparison may be his way of acknowledging how the skills and knowledge required for one translate to the others. Perhaps indicating their gender and age differences, Grette (woman, 54) also commented on this task, but called it “dressing the avatar”: “When I did it that it reminded me a little bit also when I was a girl dressing these girls, dolls. You know, the paper, where you make the dresses and put them on.” Grette went on to discuss the process of completing the game’s tutorial as similar to “these board games that I played,” with the process of finding clues similar to a detective story: “Well, the fact that I thought it was kind of thought like a detective story or something like that, where I had to solve a certain problem and there were clues along the way.” In both instances, Grette was describing the ability to transfer skills from the one experience to the other. The entities of City of Heroes also provided for opportunities of comparison. The entire world provided Ulric (man, 15) with a comparison based on knowledge; as the game depicts a modern urban setting, he compared it to the urbanscapes he knows from the physical world when he called it a “dead town.” Astrid (woman, 39) focused on a specific aspect of the game to link knowledge from one media to another; in the tutorial, she had to complete a task to learn how to fight against stationary robots. Astrid described these non-player characters as “some sort of artificial monsters with different powers.” With this description, she had added a layer of characterization to the entities that suggested a negative reaction to them. Second Life also provided a number of opportunities for people to compare entities to entities. Overall, the island of Metrotopia was seen as a deserted place by Mette (woman, 29) and Torben (man, 58). Mette compared it to an empty theater set, which countered one of her expectations of the world. The theater analogy indicates how she saw the potential of the world not being met, just as an empty theater has the potential to house a play. Torben saw it as a ghost world that needed to be more “vibrant with life”: “I thought it was – it felt more like a ghost world than a real world.” This description is similar to Ulric’s in City of Heroes, evoking the idea of a place being past its prime. Again discussing the process to design her avatar, only this time in Second Life, Grette focused on the location in which she had to complete the task. Danika (woman, 35) discussed the same place as not fitting to be called a “bazaar”. Both descriptions connote seeing and feeling the emptiness of the place. As Grette explored Second Life, she came upon another person’s house, and she described that activity as having a dreamlike quality. Likewise, further into her situation, Helsa (woman, 23) had a brief encounter with an avatar that led her to draw on her experience with fairytales by calling it a “big bad wolf thing”. Both women mentioned encounters in their situations as having fantastical elements, whether they are dreams or fairytales. Their knowledge of such phantasms translated into the virtual was a way to explain what they were experiencing. Some experiences with Second Life led others to compare it to previous experiences they had had and actions they had undertaken. Torben discussed how exploring Second Life made him feel like having a “tourist experience or ethnographer status”. He wished he had an “inhabitant” or “native companion” as a tourist or ethnographer would in the physical world. Eva (woman, 25) saw the ability to design an avatar to be anyone as similar to how it was to be in a chat room years before. Danika reflected on the overall experience with Second Life by differentiating it from the idea of games: “…and it’s not like a chase. There’s not any goal, really, like there is in the other games. So it’s more like an exploring, I think. More like adventure or just exploring.” While Torben and Eva discussed specific actions as people entering a situation, Danika discussed the situation as an action. Yet all three could see the overlaps with actions undertaken elsewhere. Comparisons went beyond being a part of the participants’ attempts to describe some aspect of their experiences with the virtual space/places. Along with this function, there were comparisons directly or indirectly related to the questions, struggles and confusions they had in response to the identified aspect of the experience. Interestingly, all of these comparisons were about Second Life. The comparisons were found with questions about the nature of the virtual space/place, or about the actions people undertake within it. Several participants were confused about the nature of Second Life; what it is and what is the purpose or meaning of it were common questions. Morten (man, 27) looked at the entire virtual space/place and compared it to social networks. He later discussed his visit to an island next to Metrotopia called Wonderful Denmark. His choice of words reflects a perspective on Second Life that references calling this virtual space/place a “world”. His first comparison related to trying to understand the general purpose of the technology, “It’s like what to do and why to do it and why is this so nice? Why do people do this? What is the catch?” His second dealt with the question of how big is the virtual space/place, which also sparked some helpful interest in the world. Both comparisons reflected an attempt to bring knowledge into the situation to make sense of it. Sofie (woman, 27) reflected on the actions done inworld as similar to social actions done in real life to meet new people. Like Morten, Sofie’s comparison was concerned with the broader question of what is Second Life, but here she was bringing in previous skills in an attempt to answer the question. Other participants reflected on their own actions or those of other people in the virtual space/place. Such as Jakob (man, 24), who continually questioned why people engage with Second Life, comparing what people do in various real life analogs that involve some level of anonymity. Morten reflected on his own actions, wondering why he had to change his avatar’s appearance: “And then all of a sudden I had to dress him up like a carnival. And its…why do I have to do that? I was confused.” Torben also discussed an action he undertook, as his wondering about who the people are inworld related to the awkwardness of meeting strangers. Their questions were concerned with people’s actions, either their own or those of others, and the comparisons appear to be describing what led to their questions: why do people do this anonymous activity, why do I have to do this, and how do I meet strangers. The comparisons were likewise focused on actions, which they may or may not have done before. But it is the knowledge about those actions that appear to be transferring. While the previous section dealt with the gaps people faced, and how the comparisons were utilized to express those gaps, in this section and the next the comparisons can be seen as part of the building of the bridge. In this section, the comparisons are those that were related, directly or indirectly, to the participants’ sense of being helped or facilitated in making sense of and moving through the situation. At times something the participant had already experienced helped them to experience the virtual space/place because of a perceived similarity between the experiences. These comparisons appear to help the people to know what to do or to want to keep doing it. For some participants, the comparison helped them to know what they had to do in the virtual space/place. Grette, again returning to the creation of her avatar in City of Heroes, discussed how it was comparable to her experience using the illustration program Photoshop. Also in City of Heroes, Danika compared going through the tutorial as being similar to playing a board game. For both women, the perceived similarity helped them to know what needed to be done in the initial stages of City of Heroes. The knowledge and skills from the past experiences helped to bridge any gaps they were facing. For other participants, the comparison was helpful for motivating them to keep going in the virtual space/place. Mette, while in City of Heroes, discussed how killing people in the game compared to the morality of war. She found this interpretation interesting, and thus kept going in the game to experience more of it. In Second Life, Grette recalled the first time seeing the water off Metrotopia’s shore, and how it was similar to the fictional world of The Truman Show. As the comparison was to one of her favorite movies, she found it helped motivate her through curiosity to see more. For both women, how they described and compared their experience to another idea or concept appears to have helped spur on their interest; the knowledge generated from the previous experience was able to be utilized to gain ideas for the present experience. While there were those times that comparisons were related to feeling helped in the experience, there were more instances of participants who said that the comparison was related to a sense of being hindered. These hindrances came in the form of not being able to experience the virtual space/place in a way that they sought, or having trouble making sense of what it was they were experiencing. The comparisons made by the participants related to criticizing various facets of the experiences, and demonstrate the tenuous line between similarity and dissimilarity. Whether or not being similar or dissimilar helps or hurts in an experience can depend on the person’s situated interpretation of the comparison. Some participants made comparisons that simply criticized the virtual space/place in general. Such as Morten, who in City of Heroes compared the game to a painting because it lacked dynamism, which he said led him to stop playing. Likewise Ulric, who likes the videogame series Grand Theft Auto, said he was continually comparing City of Heroes to that game, and finding it a hindrance because he preferred the former. As an opposite of Morten and Ulric, Eva (woman, 25) compared Second Life to real life, saying she had expected the world to be more like the real world by having more possibilities: “I suppose I expected it to be much more like the real world, which is actually impossible, but, you know, where you could just go wherever you want.” Not having this expectation met led her to be disappointed with the virtual space/place and less interested in engaging with it. Like Eva, Danika’s expectations not being met caused problems. However, as with Ulric and Morten, she compared Second Life to a media product. For these participants, two saw dissimilarities and two saw similarities, but all discussed the comparisons in ways that related to being hindered within the situation. Other criticisms were directed at a specific aspect of the virtual space/place, or at the requirements for engaging with it. For the former, Nicolaj (man, 31) did not like the unrealistic streets of City of Heroes: “…in terms of realism, it didn’t [help], because it’s not exactly what streets look like in reality. Well, the more unreal a game is, the less you can connect with it.” For the latter, Grette, in figuring out how to engage with Second Life, compared the process to how one learns anything new, where that learning process can be painful, making the overall experience less than fun. Nicolaj found the dissimilarity hurting his experience, while Grette saw the similarity in that way. Participants discussed being hindered from getting into the experience of engaging with the virtual space/place. Their comparisons reflect what led to this inability to be transported. Such as Viktor (man, 23), who compared the controls of Second Life to gaming virtual worlds, which led him to find it harder to get into the world. Flemming (man, 25) did not like the tutorial of City of Heroes, comparing the tasks to fetching sticks and moving rocks, and not at all enjoyable enough to get him into the game. Nicolaj felt he did not have a relationship with City of Heroes by referring to his relationship with his avatar as one that should have been “like an actor choosing the roles to play.” All participants here saw similarities in skills getting in their way of a successful engagement with the virtual space/place. Finally, one participant was hindered with the repeated sense of wanting to just stop the experience, and two different comparisons illustrate this frustration. In City of Heroes, Morten compared his inability to control his avatar to a toddler walking; this reflection described the struggle he had with the controls and how he just wanted to stop. After a while of being in the game, he said playing it felt like he was hitting his head against the wall, and that was the “last straw”. Morten compared his inworld actions to similar real world actions, both of which were indicators of frustration and pain, and thus the desire to end the experience. For the participants, the comparisons appeared at the primary level of describing the experiences, to oneself and to myself as the interviewer. Sometimes these descriptions would also be related to having questions about the experience, while at other times they were also related to feeling helped or hindered in the experience. Based on this analysis, the comparisons appear to have been useful at various parts of the sense-making process. They were useful to express questions, or be the source of questions. They were useful as means by which knowledge and skills could transfer from some previous experience into the current one; whether such transference helped or hindered the person appears to have depended upon the nature of the comparison, the nature of the gap, and the utility of the comparison to bridging that particular gap at that particular point in time and space. At its most basic level, a metaphor is a comparison statement: a linguistic technique to highlight certain qualities two entities share as similar while obfuscating other qualities that may not be similar (Black, 1994; Lakoff & Johnson, 1980; Miller, 1994). Metaphors are attempts to describe one entity by comparing it to another. Such use of metaphors was found throughout the interviews as the participants attempted to describe some aspect of the virtual space/place they had not previously encountered or had knowledge of. However, their use of metaphors served more than just the primary descriptive function of metaphors: they were also involved in the sense-making of the situation. Metaphors can also relate to sense-making processes through cognitive acts. The view of metaphors as involved in sense-making has largely come from the theories of Lakoff and Johnson (1980) in Metaphors We Live By. In that pivotal piece, Lakoff and Johnson theorized metaphors as more than just a form of rhetoric; metaphors were psychological. In this theorization, metaphors are mental pathways for conceptualizing the unknown, the abstract, and the virtual (events, activities, emotions, ideas, etc) in terms of the known, the embodied, and the physical (entities and substances). In this sense, metaphors are pathways for meaning-making based on experiences, knowledge, and skills. Because metaphors are pathways for meaning-making, they can influence how a person understands his or her life by informing the variety of situations that constitute everyday life (Lakoff & Johnson, 1980). The metaphors of our society and culture can become ingrained in us via the language the society and/or culture shares to relay normative values of reality. When people are experiencing something abstract or unfamiliar, what is experienced is mapped unto to what has already been experienced (Lakoff, 1994; Lakoff & Johnson, 1980; Miller, 1994). We come to know the unknown through that which we already know, either through direct, lived experiences, or through the indirect experience of being immersed in a society and/or culture (Ortony, 1994). Researchers from a variety of discourse communities, working with a variety of phenomena, have applied this theorization of metaphors to unknown, unfamiliar and/or problematic situations (ex. Hill & Levenhagen, 1995; Kalyanaraman & Sundar, 2008; Miller, 1994; Petrie & Oshlag, 1994). Metaphors, when employed in these situations, could help the person respond and adapt to an uncertain environment (Hill & Levenhagen, 1995; Morris, 2001). Seen this way, metaphors can be one of the means by which people make sense of these situations (sense-making) and/or communicate their experiences in these situations to others (sense-giving) (Hill & Levenhagen, 1995), making metaphors an important analytical focus and tool for interpretive research (Morris, 2001). As the participants were engaging with the “virtual worlds” — media products explicitly intending to replicate, reproduce and represent aspects of the physical world – their comparisons all dealt with how they made interpretive links between the virtual world and the physical world. Their metaphors highlighted their attempts to draw connections to the physical world to help them make sense of what they were doing, how they were doing it, and why they were doing it. In this way, the metaphors were as useful in the sense-making or sense-giving experiences of the participants as found in previous research. What makes the use of metaphors unique here is that it is in reaction to engaging with a media product that is by its nature designed metaphorically (Cicognani, 2000; Stanney, Mourant & Kennedy, 1998). The features of a virtual space/place are representations of the physical world: digital artefacts designed to elicit certain responses from those who engage with them. As in designing other Internet-based media technologies and content (for example, Poupyrev & Ichikawa, 1999; Stanney et al, 1998), metaphors have been useful in designing, labeling and categorizing the interface and content with which the person engages so as to facilitate this experience. According to Cicognani (2000), designing that considers metaphors can be even more useful for creating virtual space/places because they provide an intuitive means by which to negotiate with, understand, and move through the digital environment. Metaphors about places, people, activities and other objects help provide links between the physical and the virtual, facilitating the navigation of the virtual (Cicogani, 2000). Thus, the better the virtual space/place can elicit these metaphors from people, by being designed for that purpose, then the better the experience the people will have engaging with the virtual space/place. The results of this study are based on a small sample size that reduces the potential for generalizability to other people and virtual space/places. However, the findings indicate a need to consider what aspect of the physical world the virtual space/place’s design is attempting to represent. In addition, these virtual space/places are not just remediating physical entities (i.e. buildings, people, plants, etc); they are also attempting to remediate physical activities. A number of the participants’ metaphors were comparisons about actions and skills, what people needed to do and how to do it; these were attempts to find analogs for something more than just describing virtual entities. For some people, a virtual space/place may be successful if it realistically replicates the physical entities, while for others the replication of physical activities may be of greater concern for successful engagement. The analysis presented here is limited by the nature of the project. The study involved a sample of non-English speakers not being interviewed in their primary language. The comparisons could also be attempts to reframe their thoughts out of Danish and into English. The issue of translation was seen at times when the participants would speak in Danish during the interview and could not think of an English word or phrase to express their thought. Additionally, any metaphors that are more easily expressed in Danish, especially metaphors that are conventional for the Danish culture, might be lost as the participants spoke in a second language. The parameters of the study should be replicated within the context of both interviewee and interviewer speaking the same first language so as to correct for any possible spurious influence from the lack of overlap in languages. As for now, this analysis demonstrates how the use of metaphors in the sense-making process can tell us more about how people perceive and interpret aspects of the media product with which they engage for the first time, and even whether or not they want to continue the engaging. Metaphors can help a person overcome a problem they are experiencing in the engaging, or it could be a way to have the unfamiliar become less so. The metaphors they use relate to specific physical entities and activities they have encountered through their lives, and this transference of knowledge and skills can help or hinder their engaging with this new media product. If these are the types of metaphors people bring into the engaging to make sense of the media product, then designers could learn from people’s metaphors to better design the virtual space/place to match how people experience these technologies and content. Black, M. (1994). “More about metaphor.” In A. Ortony (Ed) Metaphor and Thought (2nd ed) (p. 19-41). New York: Cambridge University Press. Cicognani, A. (2000). Language and design in text-based virtual worlds. Journal of Network and Computer Applications, 23(3), p. 247-274. Dervin, B. (2008). Interviewing as Dialectical Practice: Sense-Making Methodology as Exemplar. Paper presented at International Association of Media and Communication Research. Stockholm, July 20-25. Dervin, B. & Foreman-Wernet, L. (Eds.). (2003). Sense-Making Methodology Reader: Selected writings of Brenda Dervin. Cresskill, NJ: Hampton Press. Hill, R. C. & Levenhagen, M. (1995). Metaphors and mental models: Sensemaking and sensegiving in innovative and entrepreneurial activities. Journal of Management, 21(6), p. 1057-1074. Josephs, I. E. (2000). A psychological analysis of a psychological phenomenon: The dialogical construction of meaning. Social Science Information, 39, p. 115-129. Lakoff, G. (1994). “The contemporary theory of metaphor.” In A. Ortony (Ed) Metaphor and Thought (2nd ed) (p. 202-251). New York: Cambridge University Press. Lakoff, G. & Johnson, M. (1980). The Metaphors We Live By. Chicago: The University of Chicago Press. Miller, G.A. (1994). “Images and models, similes and metaphors.” In A. Ortony (Ed) Metaphor and Thought (2nd ed) (p. 357-400). New York: Cambridge University Press. Morris, R. C. (2001) Online tables of contents for books: The user’s perspective. PhD Diss Univ Michigan. Ortony, A. “Metaphor, language, and thought.” In A. Ortony (Ed) Metaphor and Thought (2nd ed) (p. 1-16). New York: Cambridge University Press. Petrie, H.G. & Oshlag, R.S. (1994). “Metaphor and learning.” In A. Ortony (Ed) Metaphor and Thought (2nd ed) (p. 579-609). New York: Cambridge University Press. Poupyrev, I. & Ichikawa, T. (1999). Manipulating objects in virtual worlds: Categorization and empirical evaluation of interaction techniques. Journal of Visual Languages and Computing, 10(1), p. 19-35. Reinhard, C.D. (2011) Studying the interpretive and physical aspects of interactivity: Revisiting interactivity as a situated interplay of structure and agencies. Communications: The European Journal of Communication Research, 36(3), pp. 353-374. Reinhard, C. D. & Dervin, B. (2012b). Application of Dervin’s Sense-Making Methodology to Media Reception Studies. In A. Valdivia & R. Parameswaran (Eds.) International Companions to Media Studies. Oxford: Blackwell Publishing. Schroeder, R. (2008). Virtual worlds research: Past, present & future. Journal of Virtual Worlds Research, 1(1), http://www.jvwresearch.org. Stanney, K. M., Mourant, R. R. & Kennedy, R. S. (1998). Human factors issues in virtual environments: A review of the literature. Presence: Teleoperators and Virtual Environments, 7(4), p. 327-351.